Civilization is one of the most prestigious gaming franchises still in production today and has sold more than 33 Million copies since it debuted in 1991. Civilization V alone sold more than 8 Million copies on Steam since 2010 and remains one of the most popular 4X games ever made. The newest entry in the franchise, Civilization VI, releases October 21st, 2016 for PC, OS 10 and Linux. In Everything You Need to Know About Civilization VI we will tell you everything that you need to know before ou go out and buy Civilization VI. Civilization VI is on our radar for quite some time and it is one of the top 10 games for October. Check out our Top 10 Best Games for October to learn more about other games on that list. 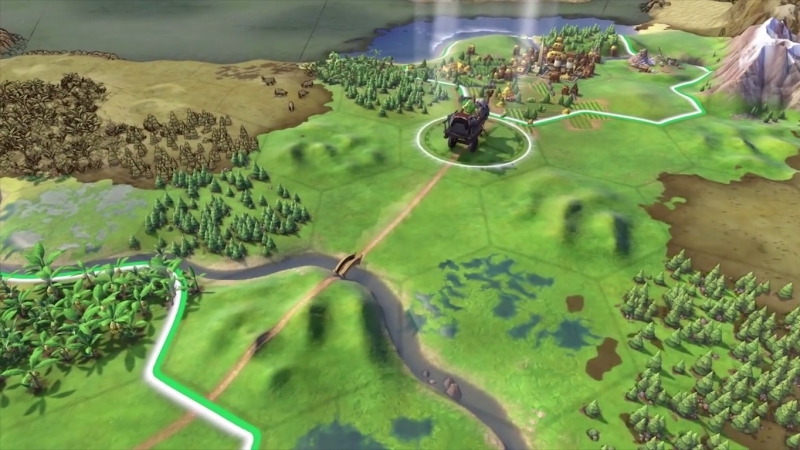 Like the previous games in the series, Civilization VI is a turn based 4X strategy game. If you are new to the sub-genre, 4X stands for Explore, Expand, Exploit and Exterminate. 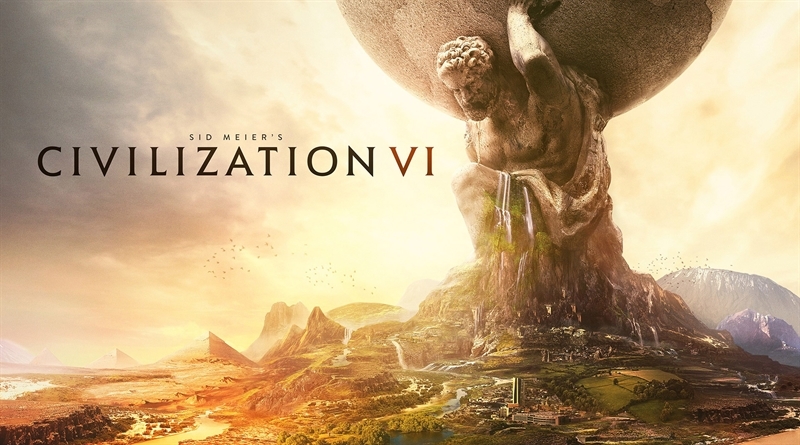 Like other 4X games, Civilization VI features deep complex gameplay with a focus on economic advancement and technological research development as well as multiple routes to victory. The goal for civilization is to build an empire that stands the test of time from stone age to the information age and become the foremost culture on the board. The team’s approach to this new entry follows series’ creator, Sid Meier’s 33% rule. So, 33% of the game will retain systems from earlier games, 33% will be improvements & tweaks and 33% % will be new material. One of the first major changes that you will notice about the game, when compared to its predecessor, is the art style. Where Civilization V was somewhat realistic, Civilization VI has more colorful and non-realistic approach. This art style approach is almost reminiscent of Civilization’s console spin off, Civilization Revolution. While this change hasn’t been entirely popular with the fans, developers cite the reason for this decision as increasing readability of units and characters from a distance, since so much of the game is played from a zoomed out perspective. The game is developed in a new engine that aside from the shift in graphic style also introduces the support for a day and night cycle and camera rotation. But the real gem of any Civilization game is the gameplay, and there is a lot of stuff to chew on in Civilization VI. Which brings us to the other most obvious change from Civilization V to Civilization VI. 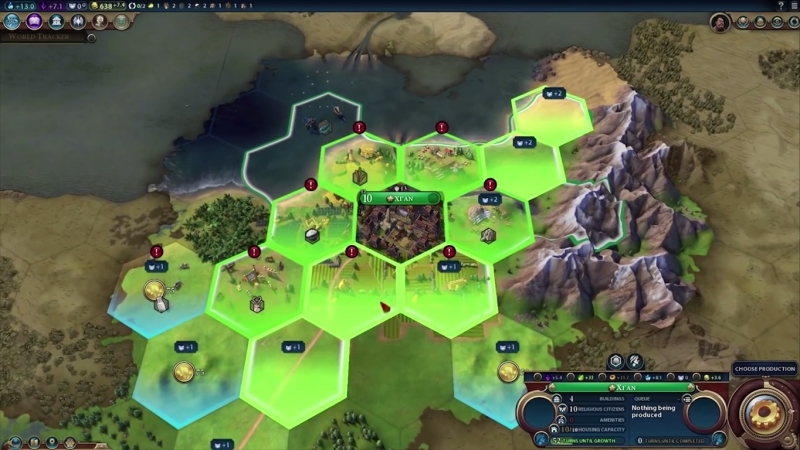 There’s a new idea in Civilization VI which is un-stacking cities. Previously all improvements made were considered to be stacked on the same tile where the city was located in. New to Civilization VI, is the management of distinct districts that sprawl across the map. As you build out and plan a city, the placement of districts will determine how well that district functions. For instance, Campus and Holy sites will receive a boost from being placed near a mountain. Other districts like a commercial hub will have a population requirement. Wonders from previous games are back as well, but similarly to districts, Wonders will be constructed on their on tiles within the city limits and will interact with districts for various bonuses. Players will also be able to attack specific districts of an opponent’s city to affect the operations of that city. And this may play into defense as well such as by placing military encampments that can then help defend the city center. Each city will have a distinct appearance which will also reflected across all units depending on which civilization you’re guiding towards world dominance. There are 18 different civilizations to choose from with each having a distinct appearance, unique ability and two unique components. Some civilizations also have multiple options for leaders and each leader then provides their own unique ability. Some leaders will also add some additional unique unit to their civilization. For example, Greece has the civilization ability of ‘Plato’s Republic’ which adds one wild card policy slot regardless of government type, the unique unit of HopLite, and the unique infrastructure of ACROPOLIS that replaces the theater. 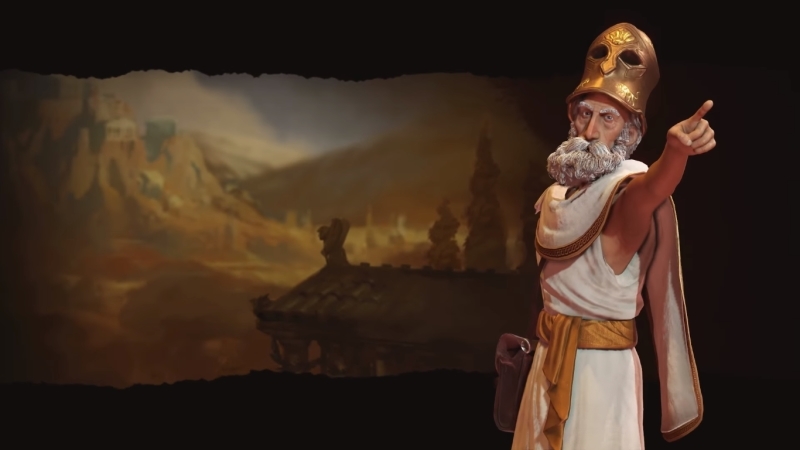 If you choose to lead Greece with PERICLES, you will get the leader ability surrounded by glory which offers a boost to culture output for each city state you control. If you lead with GORGO instead, you will get the leader ability of THERMOPYLAE which provides a culture when you defeat enemy units. In Civilization VI you’ll find that each AI leader also has a specific agenda that they’ll pursue to keep you on your toes through each campaign. How you achieve victory in the game depends in your playstyle. There are several updates to each path that will definitely keep you busy for a long time. For example, take science, research and advancements is a more proactive process and your in-game actions will affect your progress. There is an entirely new mechanic in the game called Eureka Moments which represents real life revelations that result in ground breaking new advancements. For instance, if your city has access to to a coast, you will make better progress towards unlocking navigation. Civics are another new aspect of research encompassing non-military and non-scientific advancements that support players concentrating cultural developments and diplomacy over military tactics. Similar to scientific technologies from previous games, Civics are organized in a research tree which requires a certain progression path to unlock certain Civics. 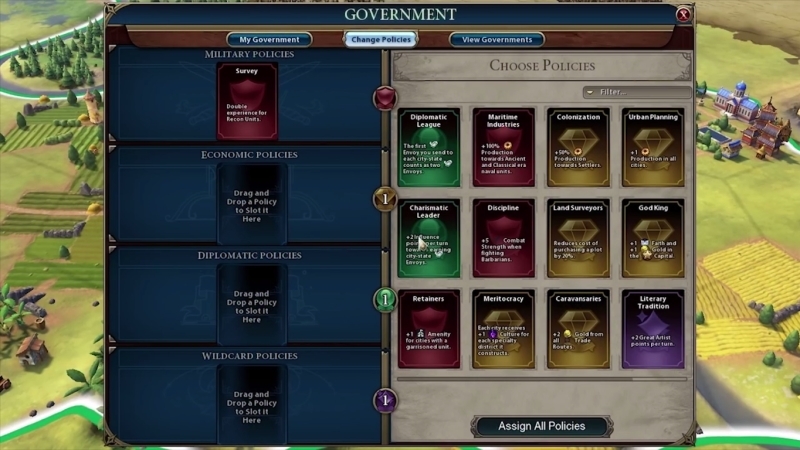 Developing Civics will unlock new game item called Policy Cards which can be used to unlock new units, buildings, districts and wonders. Policy Cards can even be put together to form a government. Diplomacy has also been overhauled from previous games. And in Civilization VI Diplomacy become increasingly important as you advance through the eras. It may not matter so much in the earlier stages of the game where warfare is near constant but later on a war will damage your diplomatic relationships more. As we noted little bit earlier, each leader you are up against, has his/her own objectives and personalities. So, one leader may have obsession with wonders and won’t take it kindly if you are racing him to build wonders first. If you are particularly clever though, you may be able to set leaders against each other based on their own agendas. Espionage will similarly change as your civilization advances through the ears, starting off as a gossip where information being passed along trade routes. This is how you will lean your opponents agendas too and will be a crucial element to early gameplay. Religion is also very important in Civilization VI, particularly early on in the game. It is also one of the worthy elements in deciding a winner in the game. You will advance putting up buildings, participating in theological combats and building wonders. You can also pressure cities to accept your religion or can go more stealthy route by sending missionaries and apostles or just by finding your own religion. Like earlier entries in the series, you can choose to play the game against AI opponents or play against other people. 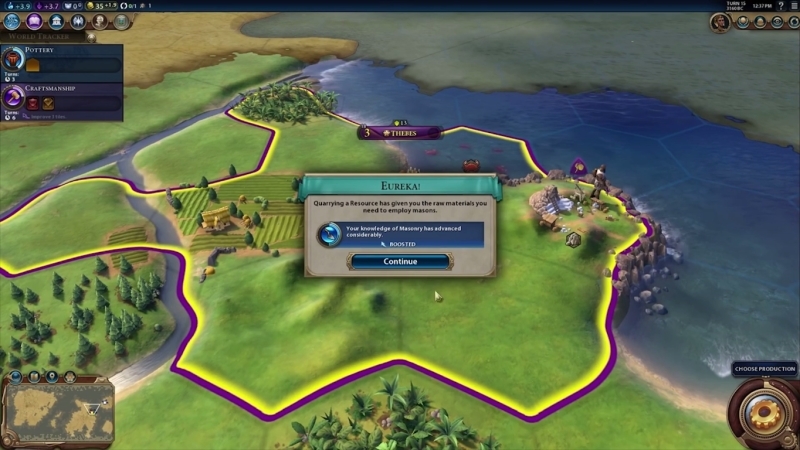 Because a single game of Civilization can be such a time commitment, the developers have added additional modes designed to let you cooperate or compete in a match in a single session as short as an hour or two. There are also options to play with non-standard win conditions such as whoever has the most money when the time is up or who establishes the strongest religion. If that’s not enough for you the game will have full steam workshop support for mods so you can customize you game. If we take Civilization V as an example, you can expect new unit types to complete overhaul to turns the game into a Game of Thrones Battle for Westros. No post launch content has been announced yet, but based on Civilization’s track record, it is likely you can expect 3-4 add-ons that will then change the scope of the game, add new factions and mechanics to keep the feeling fresh. So guys that’s everything you need to know about Civilization VI. Are you planning to buy Civilization VI? Or you already pre-ordered the game, tell us what you think about the Civilization VI in the comments below.